and it will run for up to 14 hours on a single tank of gas when used with the Eco-Throttle feature. This impressive generator provides 6500 watts of power and weighs only 253lbs. 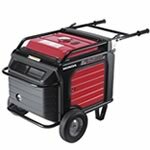 The Honda Inverter Technology makes this generator ideally suited for use with sensitive electronics because the generator produces a clean sine wave of energy that results in no surging. 33.5" x 26.4 " x 27.5 "